Theodore Newton Vail was a U.S. telephone industrialist. 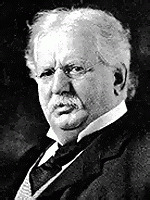 He served as the president of American Telephone & Telegraph between 1885 and 1889, and again from 1907 to 1919. Vail saw telephone service as a public utility and moved to consolidate telephone networks under the Bell system. In 1913 he oversaw the Kingsbury Commitment that led to a more open system for connection.